For the longest time I always felt that the chaos I created on my work space should be cleaned up when I was through for the day. Tools away, papers trimmed and out of sight, glue, dots, scissors, rules....everything in it's place, out of sight. Neat work space. Well I would get a bit frantic returning everything to it's designated space...and it was amazing how everything would be cleared in short order. Except the papers and the cut dies and punched shapes. They would get slipped in to a clear plastic envelope for next time. What happened over time is a large bin of coordinating paper die cuts, punched elements, frames etc., in various stages of in-completion. Sometimes sorting through papers I will pull out an envelope that catches my eye and put a card together in no time. After snooping on so many desks around the world, I want to have everything possible out, VISIBLE, ready to use. And now I do, declaring this is not a public space, it's a studio space. I just wish I had hard wood floors in here. Here I'm working on place cards to match the purse favors. Bird Cards offered this place card file free and at a perfect time for me to use for our fashion show and luncheon. Using the scraps I cut 30 place cards, then using those scraps I punched flowers and leaves. I glued the inside circle scrap adding 2 punched leave clusters and 9 little flowers pinched together for dimension...see the tray full of the floral sprays that will be attached to the place card after we print the name labels. Below 4 bins containing tape,and adhesives, stamps and ink, punches and other various embellishments. High and low ready to go...everything within reach You can see the desk wraps around 3 sides with the fourth side open for entry. Want to play along? Visit the Stamping Ground to find out how. I'm trying to keep this short....so any questions??? just post it in the comment area, I'll be sure to reply. Hi Carole, what I would give to come out of the closet and have a wrap around desk.....it is my fantacy for sure!! You are really on a roll with your place cards, they are darling. I have tried that cleaning up and putting away everything, but then I am like you, have bins and bags and drawers full of things that NEED to be used....LOL I think we are all guilty of that in many ways. You gotta do what you gotta do! Working space, neat and tidy or chaotic with everything to hand . . . it's whatever works best for YOU! Just say no to cleaning! :) I like having everything out and ready to go! Nice work space. My room is so small it pretty much wraps around my desk! LOL! I did finally have to clean as my desk completely disappeared under the mess and I was unable to work. Thanks for visiting and happy WOYWW! Yup....just finished my 3 week endeavor organizing my room. My space is in the front of the house so I wanted it to be neat for people walking by, not to mention it had gotten out of control. I totally agree that things need to be readily accessible or it won't work. Sounds like you put a lot of thought into it and it's working for you. WOW, I would love a three sided desk! Pretty place cards and baskets! Thanks for stopping by, happy WOYWW! I'm glad I'm not the only one who likes to keep all of her stuff out and easy to just grab! You saw my desk is crazy! And, I have a clear plastic pencil holder that I keep all of my extra "bits" in. When I am stuck for something I go to the clear holder and find not only what I am looking for, but inspiration for the next project! isn't it fun??? You smart ladies who keep your glue stored upside down! Wonderful bunch of crafty supplies! 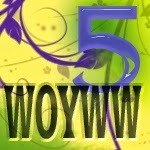 thanks for dropping by my blog and leaving a comment for WOYWW. As usual I'm late getting around but here I am at last :o). I just had a giggle to myself when I realized which "Carole" you are as we have been on some yahoo groups together...it didn't click till I saw your full name on the place card in your photo. Yes my hands are healing fast now thanks. Love that you have gone to the other "side" and now don't feel the need to put everything away at the end of the day. Your baskets, flowers and place cards look awesome. Popped in to see WOYWW 207, but I guess you aren't playing. Hope you're doing something fun with the grands or something fun with your crafty goodies!